Hi, I know this may go to the CURA forums but as I’m having the issue with the snapmaker and there are some other users here using Cura I may be able to understand the issue. Problem is with the printing not starting due to a bad nozzle temperature setting, the printer does not recognize the temp gcode and is thinking that the goal temperature is zero. If I replace those gcodes generated by cura with the gcodes generated by snapmaker software the issue is solved and the printer prints correctly. Anyone knows where to change in cura the gcodes used to make it compatible with snapmaker or if this is due to snapmaker not following gcode standars? This post is to get insights of what is happening, I have no problem with replacing the headers to be able to use the cura software. Doug the newbie here. I am on the road to test Cura and found these windows to enter new settings and will try shortly. I setup a printer named Snpamker and will alter settings for ir. He did it, and me too, but the print temp is still not recognized (shown as 0℃). Replace that several lines of code will solve the problem. @doug, I did that, those headers are OK, but before those, the gcode file contains instructions for nozzle and bed temperatures. If you see the codes I shared, Cura uses different gcodes for nozzle temp than snapmaker software. Short answer: Just wait. Once the bed reaches temperature and stabilizes the nozzle will come up to temperature. Cura does things just a touch differently. Since often the bed will take longer to heat up, and you don’t want your print nozzle at temperature cooking your filament while the print bed heats up. The GCODES used cause the system to wait for the bed to come to temperature first. 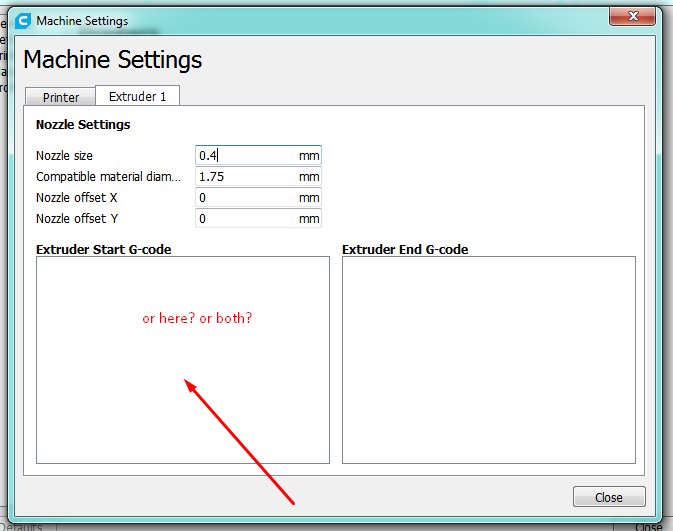 You can always modify the Extruder Start Gcode, if you prefer not to wait. I use Cura quite successfully. It brings up the print bed temperature first and then then the nozzle temperature and away we go. 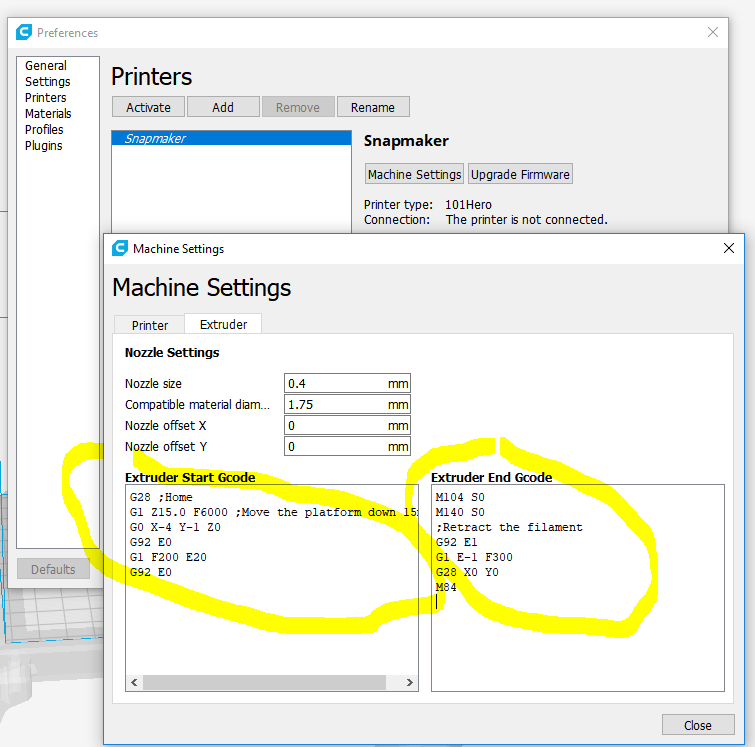 so do we paste the settings from the Snapmaker profile for Cura to the printer settings tab or the extruder tab? very good question! Since Cura splited the settings in two tabs, where shall we enter the start and end G-Code? I have mine in the Printer tab and it works like a charm. Hey Vask - Just put them here like normal. 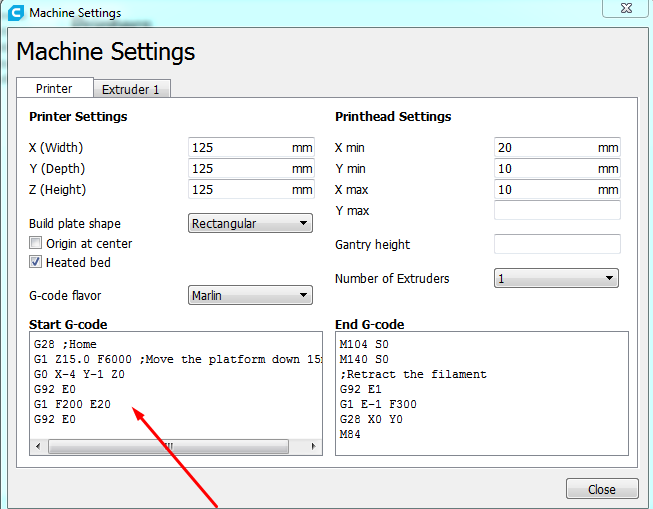 It’s cool that Cura is adding more options, though it’s reaching a point where they might need a “basic” setting for their machine, not just gcode generator.